Thanks for permission of Jeremy Hewitt to use his website at: hoptonwoodstone.co.uk. clear-cut after 130 years weather. 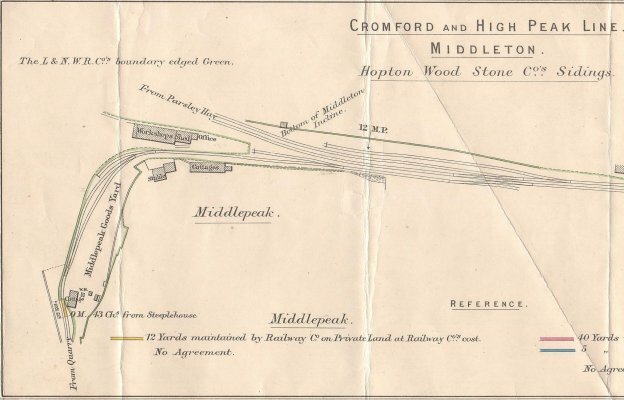 by a short branch line from a point near the foot of Middleton Incline. matrix to make layer on layer of limestone. Lower Carboniferous Limestone is the unique Hopton-Wood Stone. than in the formation of most other mountain limestones. the great charms of Hopton-Wood Stone. as brilliant as that of any marble obtainable. seem more desirable to the discriminating taste. paper, or pretend to functions which it is not in fact performing. in feeling with the mode. It must be a well-mannered stone. appeals to the sophisticated modern taste for subtlety. especially suitable for columns, pilasters, staircases, ashlar, and flooring. effects or sawn to 3/4 -in. thickness for wall linings. which are devoted to the quarrying and preparation of the stone. which are then gently pegged till the two halves fall apart. heart of his stone an irremediable fault. queue with other characteristics equally important. the stone will never stain or powder. contrast to the scaling wall behind them. a mausoleum, this lovely stone will fulfil every conceivable requirement. any sculptor cares to make it. not satisfy explicitly all the exacting canons of his difficult art. the former group and at an elevation of about 1,000 feet above sea level. themselves cut out of the West and East faces of the same hill. interstratified similar to a damp proof course in a thick wall. western quarries and is known to the quarrymen as the "Great Clay"
it lend added beauty to the stone when polished. of coarser crystallisation which has undergone a process of decomposition. "Toadstone" which is often given to this particular form of Dolerite. 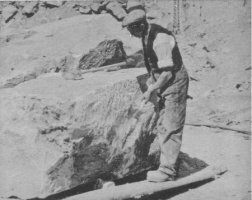 which Hopton-Wood stone from below the Toadstone has been produced. of purity is essential for manufacturing or chemical processes. of interest to some of our readers. Derbys. & Notts. Electric Power Co.
modern plant and is capable of turning out 10 tons of tarmacadam per hour. pieces the size of small marbles. Some of these sizes are used as "granitos"
height varying from 200 feet to 60 feet. finest light Hopton-Wood Stone in blocks of moderate size. This account of Middleton Mine was written in 1993. Middleton Mine is located 4 miles south-west of the small town of Matlock. stretching 50 kilometres north to south and 20 kilometres west to east. 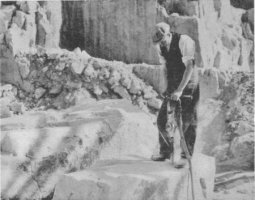 1900's there was a well established dimension stone operation at the site. crush the limestone to supply the steel and sugar industry. products, so the decision to commence underground operations was taken. grade limestone have been extracted for the underground workings. Mine is divided into five main production areas by normal faults. equally by Pluess-Staufer and Blue Circle at the time of the purchase. Pluess-Staufer are now the sole owners of Omya Croxton and Garry. the original pattern of 11 m wide roadways and 14 m square pillars. 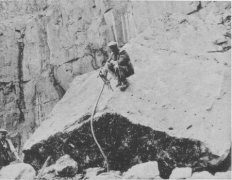 Scaling - when the loose rock is barred down from the face, roof and walls. of 4.8 m. Sixty six holes are drilled per face in a wedge pattern. the face 4 to 4.5 m.
processing plant where the material is crushed and screened. Plant has tertiary crushing, screening and drying processes. Middleton Mine produces a range of products varying in size from 125 mm to 150 microns. These products are used to supply industries as diverse as glass making, sugar refining, mastic asphalt, vinyl floor coverings, bathroom ware, fertilisers and animal feed products. The largest single customer is the sister plant at Hopton where it is ground in various grades from 250 micron to 12 micron. The limestone is usually employed as a filler or extender in rubber, plastics, ceramics, adhesives and other industrial manufacturing process. 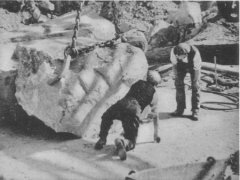 THE QUARRYING OF HOPTON-WOOD STONE. BY H. A. J. LAMB, A.R.I.B.A. 0ne hundred and fifty years ago there was a small spinney called Hopton Wood. 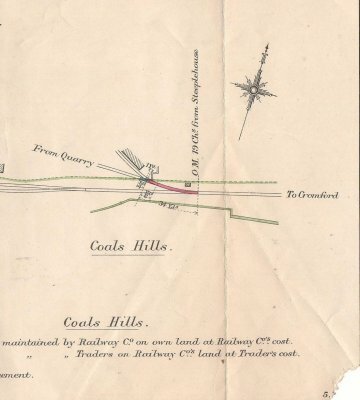 It was situated 800 feet above sea-level, south-west of Matlock, and on the heights above Wirksworth, an ancient market town, once an important centre for lead mining. The particular species of Derbyshire stone quarried here has long been worked out. 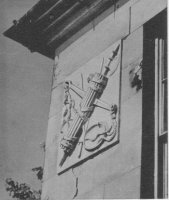 But to-day, in the neighbourhood its name has been adopted as the trade-mark of the HoptonWood Stone Firms, Ltd, an amalgamation which came into being in 1905, and who are the sole producers of this well-known oolitic limestone, which has the characteristics of, and is practically akin to, marble. Middleton Quarry is the chief working, whose face towers upward for 150 feet or so. There is a heavy overburden of loose soil and stone to the claybed from ten to twenty feet thick, which adds considerably to the cost of reaching the stone measures beneath. Mr. A. Player Cotterell pointed out that it is the presence of clay which gives Hopton-Wood the semblance of marble, the volcanic heat of a dim age being retained by it, and thus bringing about this metamorphosis in the stone. In colour, it varies from the dark greyish shades near the surface to lighter creamy tints as depth increases, though the fossil composition varies but little. With wedges and jacks the stone is prised from its bed in immense blocks, which have to be split for ready removal. The formation makes it necessary to work from south to north across the face of the quarry, and is a labour helped by the natural vertical fissures and the thin clay bedding between the strata. Sometimes blasting is resorted to with slow-action powder, but this is very seldom. 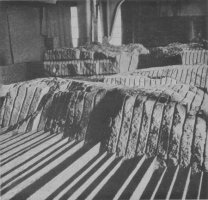 For in this case it is vitally important for the charges to be fired simultaneousy by electricity if the block is to break away satisfactorily and have a commercial value, though actually, whatever method is adopted, only about one-fifth of the quarried face is marketable, for quality, not quantity, is a factor to be reckoned with. From across the quarry men looked almost like flies working high up on the vertical face. 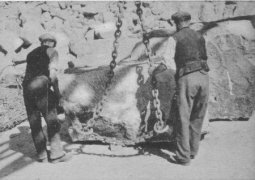 The stone they dislodge with crowbar and wedge is dropped on to a bed of rubble prepared below, where it can be picked up by a 20 or 10 ton steam crane and manoeuvred for rough dressing by hand and by cornpressed air drill. In the rough, the beauty of Hopton-Wood is not apparent, since its real attraction for architectural and monumental purposes lies in the figuring, which is emphasised by rubbing, and more particularly by Polishing. What can be achieved in this respect is well illustrated in the dressing sheds, where a 20 ton electric crane takes charge and transports the stone to the workshops. Before time and labour are expended, however, every block is first of all pared by a wire saw, to see if it is worth working up. What industry this entails can be gleaned by a glimpse into a large shed. It contains, amongst other things, a range of five electrically-driven frame saws, which slice the stone into slabs for wall linings or paving, or thicker blocks for door posts, lintels, Etc. The process of cutting is achieved by a continual feed to the saws of sand and water automatically mixed by a system adopted by the Belgians. The mud is decanted off, whilst the water is picked up again for circulation by a thirty-foot water wheel. A pump for this work would not be economical, owing to the presence of grit and sand. On some of the saws the grinding mixture is fed by hand and actually makes quicker working, it being possible to direct the flow more accurately, and results in a cut of two inches per hour being made, as against the three-quarters-inch made by the Belgian method. Another corner of this shed is occupied by a rubbin-bed for giving a preliminary surface to the stone. It takes the form of a 13 foot power-driven wheel, rotating horizontally, and made of cast-iron plates, the friction powder being sand and water. The final polish is supplied by a revolving burnisher of felt, with the aid of putty powder. It is used in the handwork shed, where intricate mouldings and carved work could not be rubbed up by machinery. It also comes into play on the assembly bench, where the various members of some feature are pieced together to see that jointing is true and no surface is proud. A tragic reminder of the part the firm were called upon to play as an outcome of the War stands in another corner of the workshop. It is a machine for engraving the headstones for the British War Cemeteries. Working on the pantagraph system, a disabled ex-service man could trace over a regimental badge or inscription on a die, whilst a similar tool reproduced his movements simultaneously on the actual stone. Thus, with these ingenious machines, it was possible for over 300 headstones per week to be completed. Not long ago, when H.R.H. the Prince of Wales was staying at Chatsworth House, he visited the Hopton-Wood Stone Firms, Ltd., and was naturally particularly interested in this work. Over 100,000 gravestones have been despatched to mark the burial grounds of our soldiers who fell. Many of them have been erected in the Far East, and the contract took six years to complete. 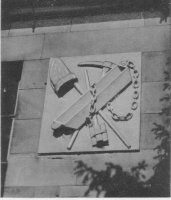 Another fine example of the use of Hopton-Wood stone in this respect can be seen in the War Memorial Cloisters at Winchester College, with a carven cross in the centre, designed by Sir Herbert Baker, R.A. A large quantity was also used for decorative paving at the Imperial Institute, London. It figures, too, in the Sheffield City Hall, whilst the Leeds Civic Building and Manchester Reference Library, both designed by Mr. Vincent Harris, F.R.I.B.A., consume a further amount. Many newly-completed buildings in London provide instances of the great variety of uses for which this stone is fitted. The staircase, wall linings, architraves, etc., of the new wing of the County Hall at Westminster; the main staircase at South-Africa House; the skirtings, handrail cappings, and sills at Shell-Mex House; whilst the Masonic Peace Temple and the new Cumberland Hotel at the Marble Arch are other large contracts in hand. A hundred men are, therefore, employed turning out 40,000 cubic feet per annum to keep pace with the demand. For in addition there is a steady call for its use in random walling, paving setts and kerbs, and in rubble for many purposes where a very high degree of purity is required. I have been doing a bit of research on the various stones used. Helles Memorial and some lie in the cemeteries in the area. A number of  Derbyshire men are also buried at Lijssenthoek. of the Cross of Sacrifice and Stone of Remembrance as well.